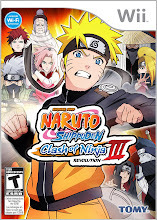 Tough I've recently started playing Naruto Accel 3 I must admit, I was a skeptic at first. My skepticism had nothing to do with the PSP or any other Naruto installments prior to Accel 3's release, but more so... it was because of the "Ultimate Ninja" Series for the PS2. I was always a fan of the "Clash of Ninja" series for the GCube and later the Wii, but never much of a fan of the PS2 Naruto fighters. There are several reasons why I'm not fond of PS2 Naruto fighters, one being the stiffness and the lack of mobility options. In the "Clash of Ninja" series the battle system allows you to sidestep attacks and cancel combos and continue with new ones. Though I do believe the ultimate reason I'm not fond of Ultimate Ninja(no pun intended)is that besides it being a 2 Dimensional game, there is a lack of skill required to win and you do NOT gain chakra automatically. This doesn't mean a beginner can defeat a pro, but more so... the likelihood of a beginner defeating a pro rises due to lack of an intricate battle system. Simply put... anyone can button mash. Much like it's predecessors Naruto Accel 3 has the same aspects I don't like about Ultimate Ninja. Though the game compensates in other ways. One being a new LNP mode where you can unlock your Latent Ninja Powers with merely a click of a button. Not only does this make up for the chakra issue, but it allows for a more diverse battle.